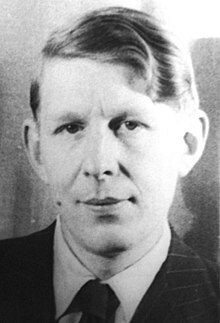 Wystan Hugh Auden (/ˈwɪstən ˈhjuː ˈɔːdən/; 21 Februar 1907 – 29 September 1973) wis an Inglis poet, wha later acame an American ceetizen. He is best kent for luve poems such as "Funeral Blues," poems on poleetical an social themes such as "September 1, 1939" an "The Shield of Achilles," poems on cultural an psychological themes such as The Age of Anxiety, an poems on releegious themes such as "For the Time Being" an "Horae Canonicae." ↑ The name Wystan derives frae the 9t-century St Wystan, wha wis murthert bi Beorhtfrith, the son o Beorhtwulf, keeng o Mercia, efter Wystan objectit tae Beorhtfrith's plan tae marry Wystan's mither. His remeens war rebuiried at Repton, Derbyshire, whaur thay acame the object o a cult; the pairish kirk o Repton is named St Wystan's. Auden's faither, George Augustus Auden, wis eddicatit at Repton School. ↑ Auden, W. H. (2002). Mendelson, Edward, ed. Prose, Volume II: 1939–1948. Princeton: Princeton University Press. p. 478. ISBN 0-691-08935-3. Auden uised the phrase "Anglo-American Poets" in 1943, impleecitly referring tae himsel an T. S. Eliot. ↑ The first defineetion o "Anglo-American" in the OED (2008 reveesion) is: "Of, belonging to, or involving both England (or Britain) and America." "Oxford English Dictionary (access by subscription)". Retrieved 25 May 2009. See also the definition "English in origin or birth, American by settlement or citizenship" in Chambers 20th Century Dictionary. 1983. p. 45. See also the definition "an American, especially a citizen of the United States, of English origin or descent" in Merriam Webster's New International Dictionary, Second Edition. 1961. p. 103. See an aa the defineetion "a native or descendant of a native of England who has settled in or become a citizen of America, esp. of the United States" frae The Random House Dictionary, 2009, available online at "Dictionary.com". Retrieved 25 May 2009.